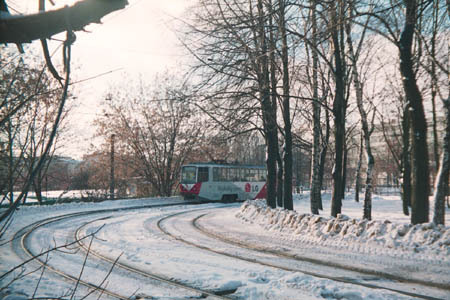 A tramline from Nizhniye Kotly village in the southern suburbs of Moscow to a settlement of Stalin Automobile Plant (now AMO-ZIL plant) workers was constructed in 1937. In a few decades the borders of Moscow city expanded, and now this line is deep inside the city limits. In 1960's the line was extended to a vast new district Tchertanovo and functioned as the main transport of this district until the Metro came there decades later. The line crossed southbound railway tracks, running along Maliy Donbasskiy overpass. This overpass made of reinforced concrete structures has got decayed during the last decades, and it was decided that no tram shall pass it with passengers. 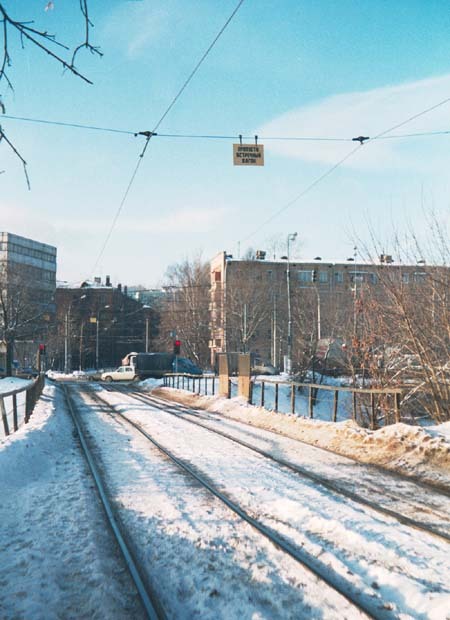 Since January 15, 2001, trams only crossed the overpass en route to and from the depot. 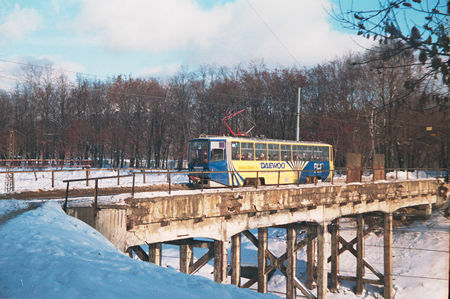 The rest of the line in Tchertanovo continued passenger service, but no route any longer went to the city centre. 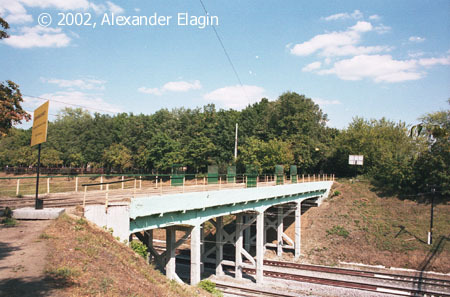 In 2002-2003, a new huge overpass was erected nearby the old one; this new overpass has crossed the railway as well as Warshavskoye highway thus eliminating a level crossing of the tramline with that heavily congested road. Regular service on routes 3 and 16 that operated here before 2001 was resumed using the new line since March 8, 2003, and the old overpass was finally demolished in March and April of 2003. A view of the overpass from Warshawskoye Shosse highway just before the interruption of revenue service. As you can see, the tramcar is still full of passengers. Tram tracks on the bridge, and traffic lights of Warshawskoye Shosse in the background. 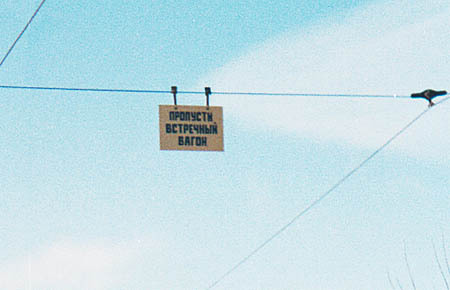 Having crossed the Shosse, the tram line goes south to Tchertanovo. The tramcar has just passed the overpass and now is making for the city centre. 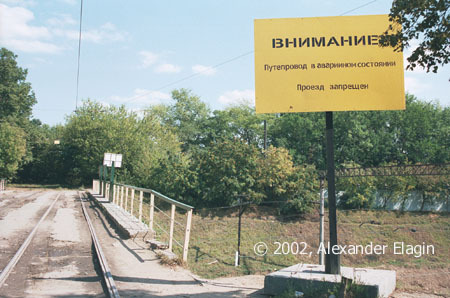 This sign tells tram drivers that they must let another tramcar leave the bridge (so that there would be no more than one car on the bridge). The overpass structures were painted in 2002 after many years. The reason for this unexpected step was rather simple: start of service on express electric train line that connects Paveletskiy railway terminus in Moscow with Domodedovo international airport. Railway officials wanted the whole line to look at least eye-catching. These warning shields on both ends of the overpass told car drivers that the overpass is damaged and unpassable. However, the more efficient method of eliminating motorcar traffic from the overpass was simpler: removing pavement from tracks!